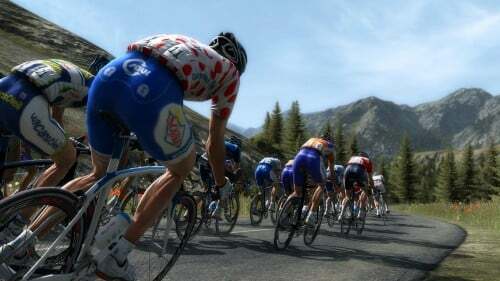 Developed by Cyanide Studio and published by Focus Home Interactive, Pro Cycling Manager 2012 features exciting cycling action, detailed management and realistic simulation scenarios and graphics. 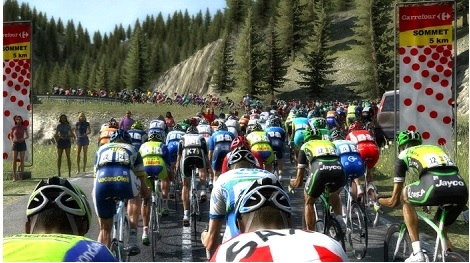 The Pro Cycling Manager game series has become a stalwart cycling simulation series stressing several detailed management systems as well as exciting race action. 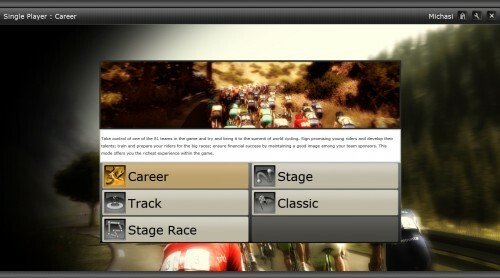 The main menu offers players a career mode, track, stage, stage race, or classic. Players get great options and customizations when forming their team including colors and team name. Choose a team from an 80 team cache, including 20 new teams in the professional circuit in a text-based interface with some icons and graphics mainly for team member nationality identification. 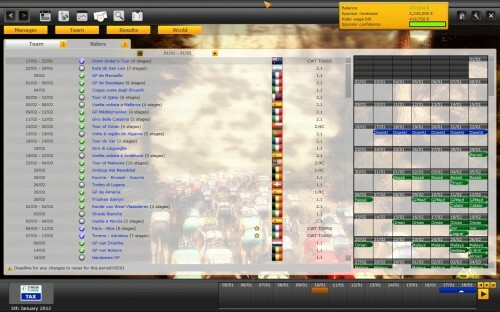 New features include the season planner where players register team members for events throughout the season calendar. The pro season consists of 180 official races including 40 new additions. The Tour de France is the “Super Bowl” of the season with many other recognizable races like la Vuelta and the Tour of Australia. Players must test all their management and multitasking skills when handling cyclist contracts, equipment, health, finances, sponsors and even training. Game developers impressive mesh all these elements together. For example, training locations also vary in length, location and expense and yield different results overall and among the individual riders. As team manager, players receive a constant barrage of detailed email messages ranging from sick player notifications to event reminders. Players can decide to skim or not skim all the text messages as they progress through each day. Players also get text updates during several gameplay situations. Players get time at the beginning for the management aspect and progress by hitting the “next day” button after making all their strategic moves leading up to the all important races. Players looking for a “quick mode” can try the race day stage simulation where tactic tests yield realistic results in a short burst or real-time simulation. Now the racing begins! Full races can be speed up to 8 times faster than real-time, but I would not recommend it much because players would miss out on the cyclist control experience that includes strategy choices and, of course, speed. The statistical results seem realistic with my limited cycling knowledge and the scenarios create interesting challenges. 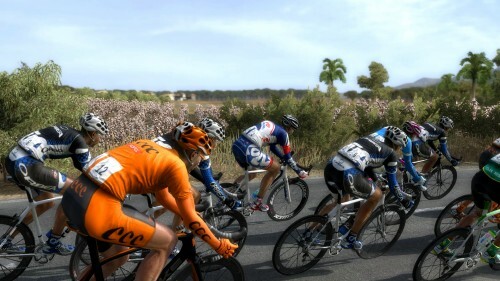 Players can really soak in the simulation experience in the races with impressive cyclist animations in large numbers. The environments could use more variety, but many players, especially inexperienced ones, should concentrate on the other cyclists any way. Developers fill in many environments well and have plenty of room for improvement as game graphic technology advances and become more affordable. Hopefully even more realistic and authentic visuals from satellite imaging can replace these environments in future installments. The realistic artificial intelligence (AI) of the computer controlled players includes impressive reactions and movements. The AI players seem very real, so players get a realistically competitive environment. The rider models, cycles, and environments all have high detail plus great lighting and shadowing effects so players get a realistic sense of each cycling experience. In the worldwide multiplayer mode includes nice team member customization and online rankings with options for up to 16 players in simultaneous gameplay. This exciting mode also stresses team support and a rewards system where players purchase collectible cards to exchange for valuable, performance-enhancing equipment. The sound elements include fast-moving instrumental music tracks that resemble some club and dance tracks, but have smooth rhythms that do not really distract from the gameplay. Races have a commentator who feeds audiences with similar tidbits seen in the text updates. An impressive team cycling simulation experience with great learning opportunities and various offerings for all age players. Cycling fans familiar with European pro cycling have an obvious advantage here (like knowing what the “peloton” is), but new players can pick up gameplay well thanks to a decent user interface. This entry was posted in Video Game Reviews and tagged cycling, Michael Siebenaler, Mike Siebenaler, Tall Writer, Tour de France, video games. Bookmark the permalink.